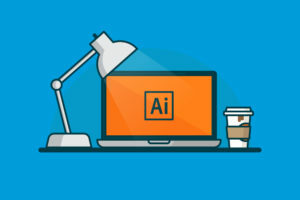 No matter whether you’re an utter newbie when it comes to Adobe Illustrator, or you’ve been using it for years, there’s always more to learn. If you’re looking to up your game, here are 10 of the best tips and tools that will help you get the most out of the software. 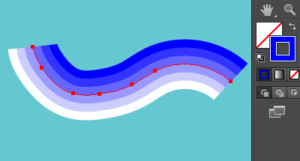 If you want to make any kind of organic shape in Illustrator, then you’re going to need to learn how Bézier points and curves work. These are designed to help you make almost any kind of shape you’re thinking of. It’s the best way to up your illustrating game to the next level, and really start creating art that will get you noticed. The only way to get better is to practice, so start playing with the tool now. “You’d think there’s no real way to make dotted lines in Illustrator, but you can actually do it with the Stroke palette” says professional designer Finn Dalton from Revieweal and the Huffington Post. “Enter the dash and gap values that you want, and you’ll get excellent dotted lines.” Experiment with these values, and you’ll get all kinds of designs that will look good in your work. There are artists out there who can make art without the pen tool, but they’re few and far between. Many beginners avoid it as it seems intimidating, but in fact you can master it without too much work. As soon as you do, you’ll be able to do almost anything in Illustrator. look up tutorials if you need help. This tool is something that only seems to be used by advanced users, but in fact it’s incredibly easy to use. If you’re always duplicating shapes in your work, then you need to master this. For example, a basic round shape only needs 4 anchor points with this, so get practicing now and save yourself a lot of time and heartache. “I’ve just discovered Brushes and they’re making a real difference to my art” says beginner designer Annette Johnson from Australian Reviewer. “They really help me add some personality to my work.” Take a look at Brushes, and use them to add brush strokes to your piece. You can even make your own brushes, and really add your own personal touch. Images in Illustrator can start looking rather uniform if you’re not careful. If that’s not the look you’re going for, the Warp tool is what you want to use. This will help you warp and tweak your shapes, to make them look more organic or just a little less uniform than the rest of your work. There are brilliant font tools to use in Illustrator if you need to add text to your work. If you’re not quite happy with how the text looks, you can make tweaks to it. You can use the Edit Type tool to start playing with Béziers and anchor points. This helps you make fonts that are unique to you and your work. Speaking of text, you can copy a text style from anywhere with the eyedropper tool. You’ve probably been using it just to get colors and gradients, but it can actually be used in this way too. It’s perfect if you’ve found a text style you really want to use. You use the eyedropper in the same way to get it. Experiment with it and get some text and fonts that are unlike anything else. When you’re trying to export images from Illustrator, you may find that you’re getting large white boxes around your image. This is irritating, but how do you get around it? The problem is that Illustrator incorporates the clipping mask when calculating the amount of space the image needs. Get around this by using the ‘Export With Crop Area’ to export the image with the correct sized border on it. Finally, if you need help with Illustrator, there are plenty of users out there that will help you get what you need. Find communities that will help you out when you need them the most. Creative Bloq and How Design are two places that offer lots of help and tutorials to get you started. These 10 tips will help you get the most out of Adobe Illustrator, and really take your art game to the next level. Start trying out new tools and tips, and see where they take you. Before long, you’ll be creating art you never thought was possible with the program! Rachel Summers has worked with students for the last seven years, helping them get the most out of their studies. She’s done this through many different companies, including custom writing company Boom Essays. Her work experience comes through in her writing, where she helps students make the most of their college years.